It was the Spring of 2002. The nation was still getting over the 9/11 terrorist attacks, I was confused about a long distance relationship that I was in, my rent had just shot up almost a hundred dollars more a month and my boss was a driving me to the point where I was either going to seek professional mental help or increase my alcohol consumption. I could create a whole website on how my boss was an over-bearing, overly-bored, scam-planning, lunch-stealing, control freak who considered you his personal indentured servant. Just because my title was, “Computer Operator” didn’t necessarily mean I would touch a computer on any particular day. 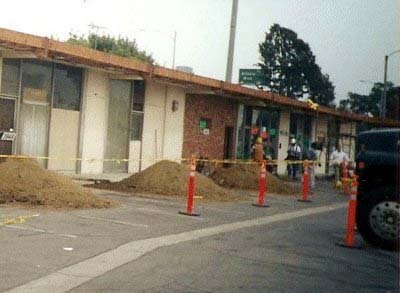 For all I knew, I could be in the parking lot rotating his tires, serving an eviction notice to one of his tenants, stalking one of his ex-girlfriends or be held captive in his office as he surfed Ebay and grilled me on departmental gossip – mainly, he wanted to know what his minions were saying behind his back. To maintain control of his department of sycophants, he would regularly rotate the employees’ shifts to keep the workers from getting too close to one another. I was the senior operator at the time, and I knew too much. It was important to him that I remain under his control. My boss gave me a company provided cell phone so he could call me anytime, in addition to giving me a “custom shift” – 4:00 AM to 12:30 in the afternoon. In that way, I could train the graveyard shift, but would be around the first half of the day shift, so he could keep his tabs on me. But what was driving me crazy was the company cell phone; it felt like I was never truly off of work. In my off hours I would take all sorts of calls from my crazy boss. Anything from “Hey buddy, what’s up? What are you doing?” to any “news” that I needed to instantly be aware of. It was mostly meaningless trivia that he had gleaned from gossip, digging through the trash, hearsay or browsing payroll records. It was hard for me to relax because I knew that it was just a matter of time before my boss would feel insecure or get bored and call me. Early one afternoon on my way home, I stopped in a nice, quaint, beer and wine bar in Torrance, just off the 405 freeway on Artesia — The Sparetime. It was quiet… and I thought after a few visits, too quiet. Low and behold, my cell phone had no reception sitting in this bar! I made it a habit of “stopping by” for a few beers after work everyday. I got to know most of the regular daytime customers, most of whom were of retirement age. The owner Ed would stop by every now and then, spring for a round of beer and throw any weirdoes out of his place. Ed is a ROK Marine who did a tour in Vietnam and had no problem keeping his bar clear of druggies, derelicts and hookers. 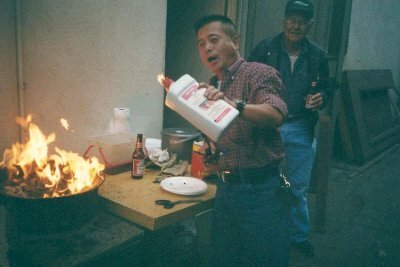 On the weekends, Ed would occasionally throw a party for one of his customer’s birthdays or other special events. 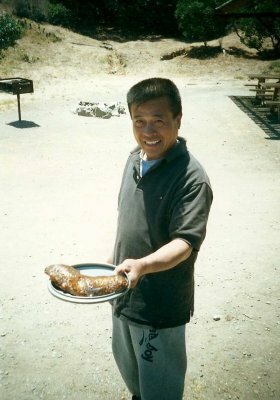 Ed can make THE BEST Korean barbecue! Whenever I wanted to hide from the reality that was my life at the time, I would stop by the Sparetime. 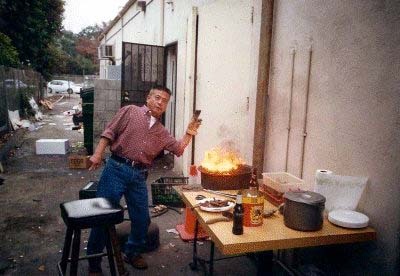 I got to know Ed really well and heard about his stories of Vietnam, hang gliding, SCUBA diving and owning a bar in East Los Angeles. 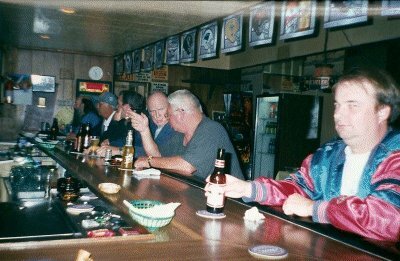 One day Ed commented to me, “You are really too young to be hanging out all the time around a bar with these old people. “You really want the next 30 or 40 years of your life to be spent in these kinds of places? He told me what I had been thinking. 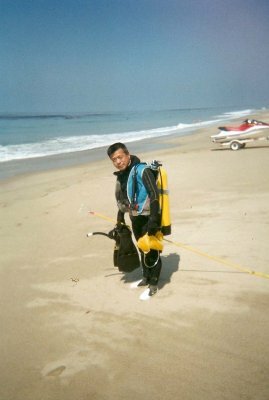 Ed is a retired PADI Instructor who loves the outdoors. He made me an offer one day to teach me how to SCUBA dive. I always wanted to try SCUBA diving. But, all the people who I had known who had taken SCUBA courses, spent three thousand dollars each on equipment and classes, only to quit diving after certification. Ed made me an offer that I couldn’t refuse. He would loan me the equipment and teach me to dive if I bought the PADI Open Water manual and my own wetsuit, boots, gloves, snorkel and mask. Several times over the next few months, Ed re-offered and I re-accepted. “Are you sure?” Ed would ask. Ed later told me he didn’t take me too seriously because I would always accept his offer while slightly (or more than slightly) intoxicated. 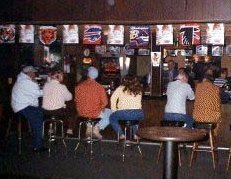 My homework was to read the PADI Open Water manual and come back to his bar in three days – sober – to review the book and dive tables. As Ed and I sat in the corner going over the PADI book; I could hear some of the customers asking each other what we were doing. I’ve been in and around water all my life, so I found their assumptions somewhat humorous. To help the information “soak in” my brain, I had a few beers after class. Ed demonstrated how to set up the SCUBA gear… and then we put our wetsuits on – at least Ed tried to. Mine fit perfectly, as I had tried it on before I bought it. Ed apparently had gained some weight over the year or two and was too fat for it to fit. Ed just wanted me to swim around Cabrillo’s lagoon to see how well I’m accustomed to the water. I floated, kicked and dog paddled through the potato chip bags, six pack rings and miscellaneous debris in the zero vis water. I swam 25 yards or so out and then back in. 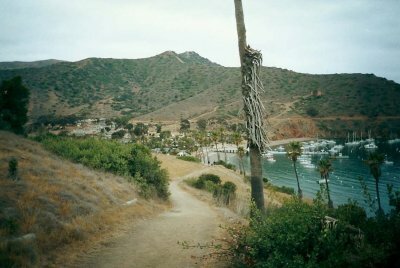 The following week was training at Two Harbors in Catalina. 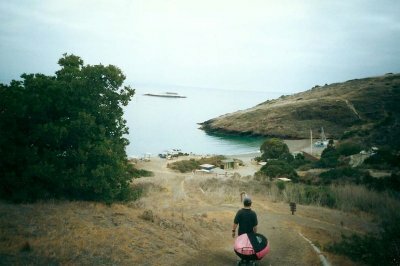 We were to go camping for two nights and two days at the camp ground and dive off the beach in the calm cove. I handed my bag to the Catalina Express crew member to put it in the ship’s hold. “We have our weight belts right here, that bag is full of beer,” I said. He rolled his eyes as he dead lifted the bag on to the conveyor belt; we were going prepared. We got to Two Harbors about 9:30 PM; the Rangers trucked our gear to the campsite as we felt our way through the dark to find our pre-assigned spot. We stumbled upon our gear that the Rangers had dumped along the trial – we assumed it was our spot. 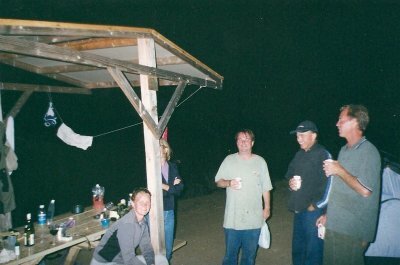 We pitched the tent as best we could in the darkness; I think we only spilled two beers. In the morning, it was hard for me to get used to the idea to not have beer for breakfast – a tradition when I usually camp. Ed explained that alcohol and carbonated beverages should be avoided before diving. Two Harbors from the trail. We overlook the Two Harbors Campsite in the morning. I set up the gear, squeezed into my wetsuit – which was an unbelievable workout in itself – and put my 38 pound weight belt on. I made the short walk down to the cove near the campsite – it felt like I was carrying the weight of a horse on my back. I couldn’t wait to get in the water to lighten the load. However, once I started to float I kept spinning like a log. “Hey Ed, I keep spinning!” I yelled. After adjusting my weights, it was back in the water. We swam several dozen yards out and rested… and rested. After a five minute break floating on the surface, we put our regulators in our mouths, deflated our BC jackets and we started to sink. I was breathing heavy so I was still pretty buoyant. Ed looked back from a depth of 15 feet, swam up, grabbed my jacket and pulled me under. Even though I was only a few feet down, I was actually breathing underwater from an Aluminum tank! There wasn’t much to see in that spot, but I felt like a spaceman, an astronaut – or at least my perception of what it probably is sort-of like as far as weightlessness and breathing from a life support system. I followed Ed, who was constantly checking my air consumption. We swam around the sort-of-barren seascape of the campsite’s cove. In a matter of 20 minutes I had sucked most of the 80 cubic feet of air out of the tank and we went ashore – I crawled out on my hands and knees as gravity took effect. A few small children playing at the beach ran over to me and asked, “Are you alright? “This crap is heavy..,” I answered. When I made it back to camp, I took my wetsuit off and slept for two hours. I made another dive with Ed later that day that was even more enjoyable than the first one. Ed collected a Sea Cucumber and some sea urchins to eat for dinner. As we were heating the seafood and Ramen, three chicks were moving in to the campground above us. I’m acting like I’m taking a picture of Ed, but in reality I’m checking the chicks out. As the night progressed, we got to know some of our fellow campers – Tim, an every-other-weekend regular – Bud, the manager to the Yacht Club here, and the three chicks above us – a workaholic magazine editor who flew back to the mainland the next day, a dike-looking heavy set chick and a really cute blonde from Sweden. We proceeded to party into the night. 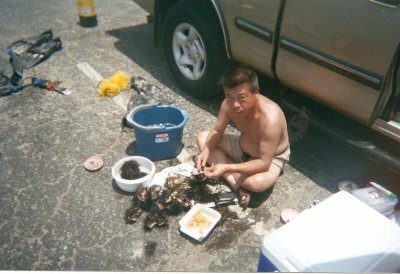 Since I was now a diver, I used my recently acquired machismo to impress the women. “Do you know why we carry knives when we dive?” I asked the Swedish woman. “We carry knives to fight off sharks,” I answered. “Oh, I don’t believe you,” she said in the cutest Swedish accent. I thought to myself that I really need a girlfriend more than SCUBA certification. All total, I was able to get three dives in that weekend. 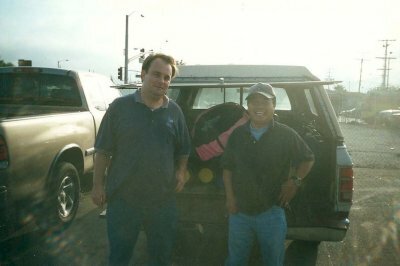 Since Ed was my friend, and teaching me out of his genuine kindness, I had no concept at that time how much I owe to him for my continued diving. To become a Certified Open Water Diver, you need to complete classroom sessions, a written test, pool exercises, a skin dive and four SCUBA dives. Unfortunately, for most people, that is not enough to instill a lot of confidence in one’s diving ability. Unless a new diver has a core group of diving buddies, 80% or more of recently certified divers quit diving within a year – at least that’s the statistic that a SCUBA manager afterwards told me. 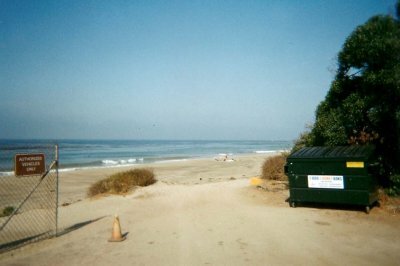 Every weekend for several months Ed and I went beach diving, most of the time at Leo Carrillo State Beach. 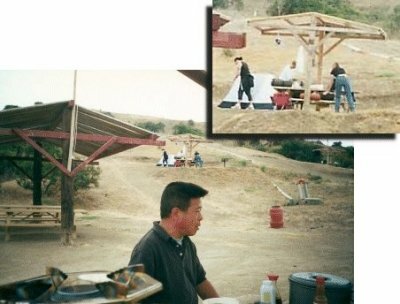 We would pack our diving gear and a cooler full of beer and Korean food and make a day out of Leo Carrillo – diving in the morning and partying until 1 PM with the likes of beach bums named Horse, Mike and Starla. Ed makes Uni at Leo Carrillo. I think I must have had 12 dives under my belt before we went to Redondo Beach for my “check out” dive – underwater removal and replacement of my weight belt, removal and replacement of my mask, clearing my mask underwater, regulator ditch and recovery, emergency swimming ascent and buddy breathing. During my early dives, I was not in great shape and certainly not conditioned for a lot of beach diving. 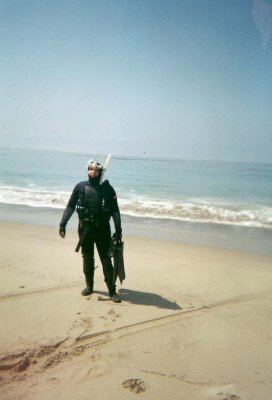 One time I crawled out of the water at Redondo Beach and just laid in the sand for 30 minutes; Ed thought that I was going to quit diving at that time. Ed worked as a security guard on graveyard shift, so he wasn’t available every weekend. 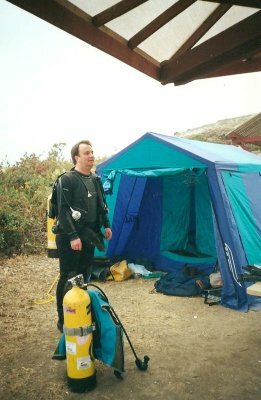 I drove up to Leo Carrillo alone one morning and met a “buddy” to go diving. Unfortunately, my “buddy” forgot to pack his mask. He was sort of a stoner-acting type person and said, “Oh wow! Sorry dude, I forgot my mask! I was a bit pissed. If I wanted just to drink, I would have driven 15 minutes to Redondo Beach and not over an hour to Leo Carrillo. I went diving alone – for about 15 minutes. The visibility was okay, I was just a little lonely and scared. I went ashore fairly quickly. As I dove more, I became more comfortable with solo diving. I have never dove with. I owe a lot to my friend Ed for getting me started and making sure I was comfortable and basically competent to participate in the great sport of SCUBA diving. Guess I never really asked you about how you got into diving but this explained it well and a good story at that. Just looking through your past posts and found how you got started. Great Story Solo! Looks like Ed got you into diving just when you needed it the most. Props to you on your blog. It truly is an awe inspiring journal of one mans journey under the sea. Many thanks for sharing!